Gagamel boss Moses Ssali aka Bebe Cool has been forced to cancel all his public appearances, two days after he was attacked at Lugogo Cricket Oval. The self-proclaimed ‘Big Size’ was among local artists lined up to curtain-raise for Jamaican reggae musician, Tarrus Riley. 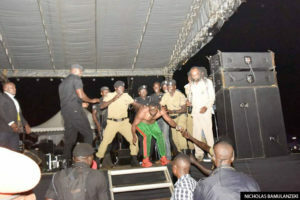 While the rest of the other artists including Maddoxx, Apass, Navio, Weasel, Winnie Nwangi, Maurice Kirya performed without any incidents, Bebe Cool was forced off stage by police after he was, firstly booed and then bottles and plastic chairs hurled at him. The revelers were chanting pro-Bobi Wine and ‘People Power Our Power’ movement slogans. People Power identifies what Kyadondo East MP, Robert Kyagulanyi a.k.a Bobi Wine, represents; a transition from pop star to the new poster child of regime change. The slogan has been adopted as the rallying cry by a movement spearheaded by young professionals, with the help of some mainstream opposition political actors, to create political change. 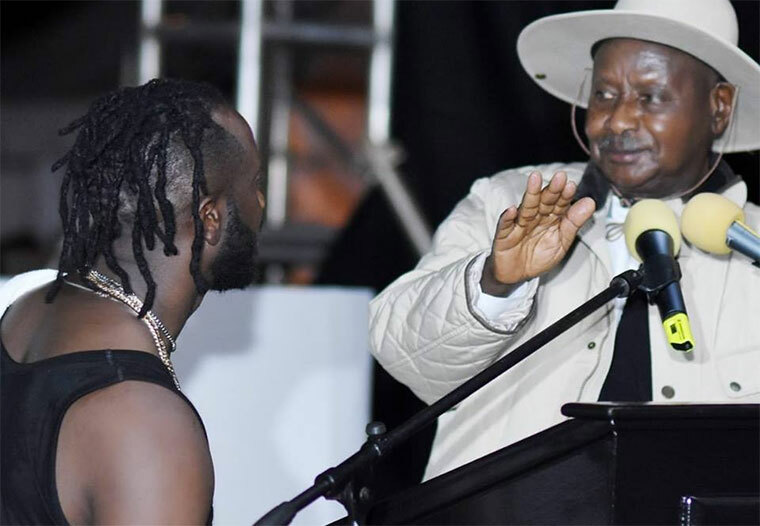 Moments after the ugly Lugogo incident, Bebe Cool initially said he would not be cowed by the ‘People Power’ movement into stopping to support President Yoweri Museveni and his National Resistance Movement (NRM) government. But in a Facebook post later on Sunday, Bebe Cool said he has suspended all public appearances until further notice. “For the last few weeks, I had chosen silence as a means to exercise my tolerance for the political events that are currently transpiring in the country. Unfortunately, while at a performance last Friday, I was pelted with bottles and stones by a group of people purportedly because I do not subscribe to their political beliefs.” he wrote. Bebe Cool’s announcement is a quick change in tone as initially he’d declared war on Bobi Wine and his supporters. The Lugogo incident was the second such incident to befall the artist within a week after he was also booed at Club Ambiance last week. He also said Bobi Wine was confusing Ugandan youth by telling them to fight for the liberation of the country and free it from the Museveni dictatorship yet according to him, Uganda is the most peaceful and democratic nation on earth. Since his brutal arrest and alleged detention, protests broke out all over the country and abroad demanding for the release of the legislator and 32 other suspects who were also arrested in Arua. Bebe Cool accused the Bobi Wine and the media of duping the public by claiming that he was tortured whilst in detention. “Bobi Wine was released after a week and he came out without any scar yet he lied to the nation that he was tortured. Can a wound heal within a week?” he asked. He further said that, Bobi Wine after seeing him (Bebe Cool) successfully host Museveni at his concert in Kololo, Bobi Wine went ahead and created chaos in Arua when he and his supporters allegedly stoned the presidential convoy so as to divert media attention. Following the chaos in Arua, Bobi Wine’s driver Yasin Kawuma was shot dead and at least 33 people were arrested and charged with treason in the Chief Magistrate’s court. The suspects are out on bail. 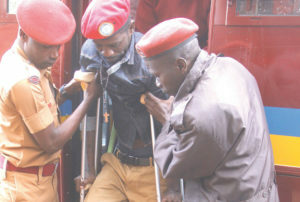 Bobi Wine and fellow legislator Francis Zaake were allegedly tortured whilst in detention to the point of requiring further treatment abroad. 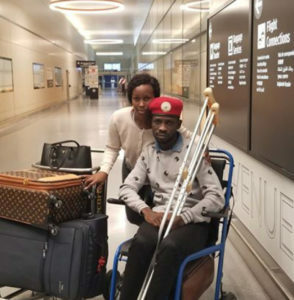 Bobi Wine flew to Washington DC for treatment while Zaake is still stuck at Kiruddu hospital after being blocked by the government. Ahead of the 2016 national polls, Bebe Cool led a group of Ugandan artists to compose a song, Tubonga Naawe, loosely meaning ‘we’re with you’ for President Museveni who controversially won a fifth term in office. The artists would then go on to perform at Museveni’s campaign rallies all over the country. The artists were handsomely paid by Museveni. Opposition political party, Forum for Democratic Change (FDC) then called on Ugandans desiring political change to boycott the artists who participated in the Tubonga Naawe project. However the boycott did not really materialise although the artists themselves kept away from the making performances for some time.